Troubadour Wembley Park Theatre set to open in Autumn 2018 in the former Fountain Studios. Fully flexible 1,000 – 2,000 seat state-of-the-art theatre from the award-winning team behind the King’s Cross Theatre. New destination theatre will include a spacious modern bar, restaurant and an open air terrace. The flexible 1,000-2,000 seat capacity Troubadour Wembley Park Theatre is being created inside the former Fountain Studios by award-winning Troubadour Theatres who will run the brand-new theatre in Wembley Park, and will work with well-known and emerging production companies and artists to stage world-class entertainment within a flexible space unmatched by other London theatres. Located within the former Fountain Studios, which are best known for being the venue of live televised shows including The X Factor, Britain’s Got Talent and Pop Idol, the new theatre will be in the heart of Wembley Park, an area which is fast becoming one of London’s most exciting destinations. As a new cultural hub for London, the 85-acre redevelopment will benefit from the new theatre, 27 affordable artist studios, 7,000 new homes, London Designer Outlet, new retail districts and offices, as well as the largest Boxpark to date – Boxpark Wembley (set to open later this year) and the SSE Arena, Wembley. Planned to be a fully flexible theatre; a space that can be transformed to suit the requirements for every show – traditional proscenium arch theatre, in-the-round theatrical experiences, or immersive shows. It will encourage theatrical producers to think big, offering them an affordable alternative space to present bold and ambitious shows. 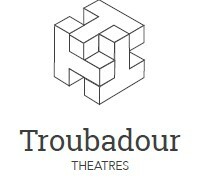 The Troubadour team, headed by Tristan Baker and Oliver Royds, have extensive experience of running spectacular theatres including the King’s Cross Theatre which consisted of two 1,000 seat theatres and one 450 seat studio housing the Olivier Award-winning production of The Railway Children, Lin-Manuel Miranda’s In The Heights, David Bowie’s Lazarus and the Donmar’s Shakespeare Trilogy. Troubadour Theatres specialises in the creation of temporary and semi-permanent theatre venues – utilising spaces which would otherwise be empty, derelict or unused. Plus there’s ample toilets – no more waiting in the loo queue during the interval. Troubadour Theatre Wembley Park is set to open in the Autumn of 2018. Details of the first production will be announced in the coming months alongside information on ticket sales. Troubadour Theatres – breaking the mould!